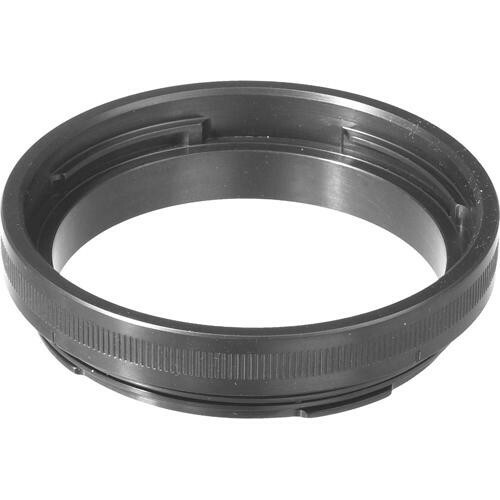 The 18456 Port Extension Ring from Aquatica is for their bayonet style housings when using one of a variety of Canon, Nikon, Sigma and Tokina lenses in an Aquatica port. Insert the ring between the port and the housing. It is constructed from durable anodized aluminum. Box Dimensions (LxWxH) 5.7 x 5.3 x 2.4"
18456 Port Extension Ring for Aquatica Bayonet Style Housings is rated 5.0 out of 5 by 4. Rated 5 out of 5 by shark8matt from solid construction, crisp photos This metal ring spaces the dome port the correct distance from your lens to allow for the sharpest image. I used this with the Aquatica 9.25 inch dome and a Tokina 10-17mm FE zoom lens. The corner sharpness of my photos was noticeably improved with the extension ring. Rated 5 out of 5 by Clecio from Good product, but expensive ! This product is necessary to AT2i Aquatica housing with Mini Dome 4' and Tokina 10-17mm lens. Rated 5 out of 5 by Anonymous from Needed for wide angle lens underwater Good gear from Aquatica.